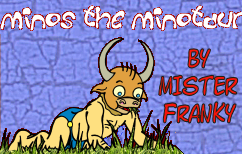 MINOS THE MINOTAUR EXTRA PAGE: FAN-ART, MINOTAUR HUMOR, AND MORE! Click HERE for More Minotaur Goodies!! !